Read the complete Detroit Regional News Hub post. If you like cars, beer and Detroit this tour is for you. On two Saturdays, Jan. 17 and 24, you can take the 3.5-hour Detroit Bumpers & Brew Tour that looks at the story of Detroit – then and now – from Detroit’s earliest auto history to some of Downtown and Midtown’s most exciting new projects. Here are just few things you will learn. At one time Downtown Detroit had more than 40 breweries. 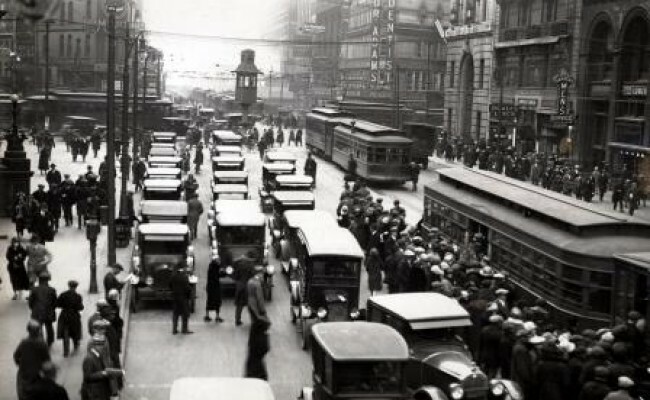 In the early 20th century, 125 auto companies sprang up in Detroit. Only a handful survived … Chrysler, General Motors, Packard, Ford, and a few smaller companies. The tour happens during the 2015 North American International Auto Show and is a provided by Motor City Brew Tours and Show Me Detroit Tours. It’s a fun way to see the city and learn its history. The tours start at the Atwater Brewery at 10 a.m. and conclude at 1:30 p.m. The brewery is located at 237 Joseph Campau. The tour looks at the early years and significant sites of Dodge, Ford, Chrysler, Olds, Fisher, Hiram Walker and Albert Kahn, and companies like Carhartt, Huppmobile, Detroit Stove Works and the US Rubber Company (which became Uniroyal), as well as former sites of the old Detroit Driving Club and Hamtramck Race Track. It includes a craft beer sampling and light lunch at Grosse Pointe’s Atwater on the Park. It’s a great time to tour Detroit. “Interest is higher than ever in seeing and understanding Detroit’s rich history in tandem with its current challenges and successes,” said Kim Rusinow and Pat Haller, co-founders of Show Me Detroit Tours. The Atwater Brewery and its offspring Atwater in the Park Beer Garden are just a small sample of the many success stories in Detroit. “Detroit’s downtown and lower east side represent an industrial and manufacturing legacy in the names of the innovators and companies once located there,” said Steve Johnson, founder of Motor City Brew Tours. For example, Detroit is reclaiming more of its manufacturing heritage. The Mt. Elliott Employment District is being rejuvenated as a manufacturing cluster. Running from I-94 along Van Dyke and Mt. Elliott roads north to 8 Mile and with almost 15,000 people employed by 1,700 companies, Mt. Elliott is already the largest industrial corridor in the Motor City. There is a lot more going on. Development downtown and in Midtown is bringing in more retail stores, residential space, restaurants and fun venues. Major historic buildings are being rehabbed. There are more bike lanes. The M-1 RAIL is on track. You’ll get to see it all. The $49.99 ticket price includes expert historical commentary, guided bus transportation and the craft beer sampling and light lunch at Grosse Pointe’s Atwater on the Park. Tickets must be purchased in advance online and you must be 21 years old. Both tour companies also offer gift certificates. Advance reservations are required. To purchase tour tickets visit: http://www.MotorCityBrewTours.com or www.ShowMeDetroitTours.com. For more information call (248) 850-2563 or (313) 444-2120. This entry was posted in Detroit events, Detroit History, Downtown Detroit, Touring Detroit and tagged Brewery Tours. Explore Detroit’s rich auto and brew history and enjoy a lunch and beer sampling stop. Two of Detroit’s top tour companies – Show Me Detroit Tours and Motor City Brew Tours – join forces once again for the 3rd annual version of this popular tour. The 3.5 hour tours will look at the story of Detroit – then and now – from Detroit’s earliest automotive history to some of the city’s most exciting new projects. Tours start at the Atwater Brewery at 10 a.m. and conclude at 1:30 p.m. on Saturday, January 17 and again on Saturday, January 24, 2015. The $49.99 tour ticket price includes expert historical commentary, guided bus transportation, and beer sampling and light lunch at Grosse Pointe’s Atwater on the Park. Tickets must be purchased in advance online. Tour guests must be 21 years of age. Advance Reservations Required. This entry was posted in Detroit events and tagged Brewery Tours, Detroit Tours, Downtown Detroit.